Brushing, flossing, and seeing the dentist are all key tenets for maintaining healthy teeth. However, even the most dedicated oral care routine cannot prevent certain conditions from wreaking havoc on your otherwise healthy smile. One of these conditions, bruxism, has proven to be one of the most common out there. According to the American Sleep Association, 10 percent of adults and 15 percent of children are affected by this harmful condition. So how can Dr. Joe Isaacson help? 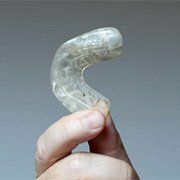 His professionally-made nightguards work to prevent the most harmful effects of bruxism before they have the chance to cause permanent damage. Also known as chronic teeth grinding and clenching, bruxism does not always make itself so obvious. Many people grind their teeth, but this doesn’t always result in permanent damage right away. It’s when grinding and clenching become regular that people should start to worry. Some of the worst diagnosed cases focus on grinding during sleep, but it can also occur as a result of anxiety of stress. It’s also more likely to appear if your bite is uneven or if your teeth are crooked. Since bruxism is not always easy to diagnose, it’s important to visit the dentist regularly. Dentists are trained to look for signs of untreated bruxism, including flat or worn-down teeth and permanent enamel erosion. Those with flat incisors for example are likely suffering from bruxism and have no idea they are until a dentist tells them. What are the Consequences of Enamel Erosion? How Can a Nightguard Help? Custom nightguards from Dr. Isaacson can protect your smile from chronic clenching and grinding. 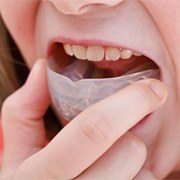 Unlike over-the-counter nightguards, professionally-made varieties offer the most comfortable fit and the most durable solution to long-term enamel erosion caused by bruxism. A well-made nightguard will more than pay for itself compared to needing fillings, crowns, bridges or dentures later in life. If you have bruxism, Dr. Isaacson will take an impression of your current bite and use that model to create your nightguard. Once fabricated, you’ll come back for a follow-up visit to ensure that it fits comfortably and keeps your bite even. If you’re suffering from bruxism and don’t know where to turn, contact our office today! Our team and dentist in Oklahoma City is more than prepared to design a dental device that will protect your teeth for many years to come.